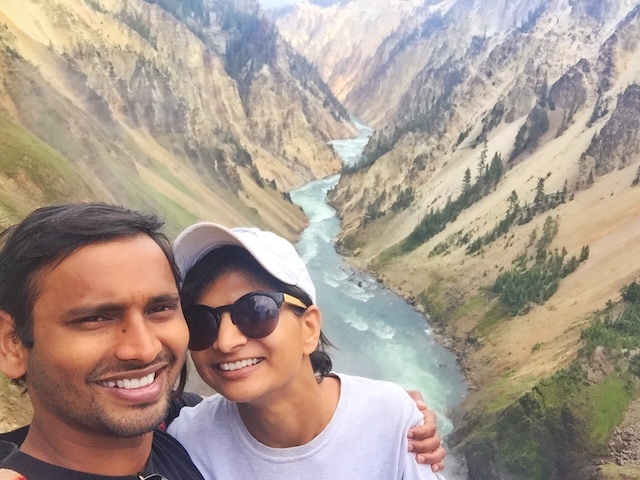 Here's a detailed itinerary for six days in Yellowstone National Park and one day in Grand Teton National Park. Yellowstone has multiple areas to visit - Canyon, Mammoth, Old Faithful and West Thumb amongst others. We allocated one day for each area, and went back to do more hikes around the areas which we enjoyed. We included time each day to see wildlife around the area we visited, and managed to see many animals including wolves and grizzlies. Except the boat ride in Yellowstone Lake everything we did here was free, and this helped us enjoy the vacation on a budget. Arrive in Yellowstone and settle down. For us, this was pitching our tent at our campground and arranging all our groceries in the bear-proof lockers. We also went to the visitor center and discussed with the rangers on how to best spend our time here. Watch sunset at one of the meadows nearby and watch wildlife if you happen to chance by it. We saw some animals from afar, and couldn't figure out what they were (yep, first days are always like that). Explore Canyon Area. It's perfect if you're staying around Canyon Village, like we did. Visit viewpoints like Red Rock Point, Brink of Lower Falls, Lookout Point, Grand View and Artist Point. Most of them are next to each other and within a short driving distance, so cover as many as you have the time for. From Artist Point trailhead, go to the first hike at Yellowstone - Lily Pond Lake and Ribbon Lake. Beautiful and serene, we didn't see a lot of hikers around this area, especially after Lily Pond lake. Don't forget to carry bear-spray and make noise as you hike to detract bears from approaching. Be on the look-out for wildlife around the area throughout the day. We saw an Osprey nest in the morning, and a family of Elks in the evening. Drive on the Grand Loop to Old Faithful Geyser, and watch it erupt. You can't see it up close like Geysir in Iceland, but Old Faithful erupts at much greater height. Next, hike around the Upper Geyser Basin on the side-walk until you get geyser'd out! One of the most colorful pools we saw was at the far end of this basin, so explore as long as you can. After that, drive to Midway Geyser Basin and checkout the biggest hotspring in Yellowstone area - the Grand Prismatic. Aptly named, prepare to feel humbled after looking at it. Continue back on Grand Loop taking detours at Firehole Lake Drive and Firehole Canyon Drive; exploring more geysers and pools. You can get down into the water in Firehole Lake and also see a cute little waterfall (Firehole Falls) on this detour. Next on Grand Loop Drive are the Fountain Paint Pots and Artists Paintpot. There are trails at both these places - so if you're still not geyser'd out - feel free to explore. We saw some wildlife near Artists Paintpot, so if that kind of thing interests you, linger around in that area around dusk. Start the day at the crack of dawn in Lamar Valley, and if you're lucky, watch wolves and grizzlies. We were unlucky, but we got to see a ton of bison families up-close! We also saw bighorn sheep as we were exiting Lamar Valley, so it wasn't uneventful after all. Drive up north and explore all the Mammoth area, starting with the beautiful terrace formations at Mammoth Hot Springs. There is a nice loop to explore here, and go to both the lower terraces and the upper terraces. Before exiting Mammoth area, don't forget to get into the hot river near the Montana-Wyoming border. This is where boiling hot water from the heated earth underneath merges with the cold river and creates a natural warm river which is perfect for relaxing after a long day. There are no rest-rooms nearby (change into swimwear in your car) and the area is not advertised - so ask about it in the Visitor Center and they'll provide directions. As a bonus, you'll get to see some nice views and waterfalls (Tower Fall) driving back to Canyon Area from this route. Start the day hiking the tallest mountain in Canyon area - Mt. Washburn. It's a moderate 6-mile hike with gorgeous views at the top. You'll see a lot of chipmunks at lower elevations and endangered animals like Pika close to the top of the mountain. This is a must-do! 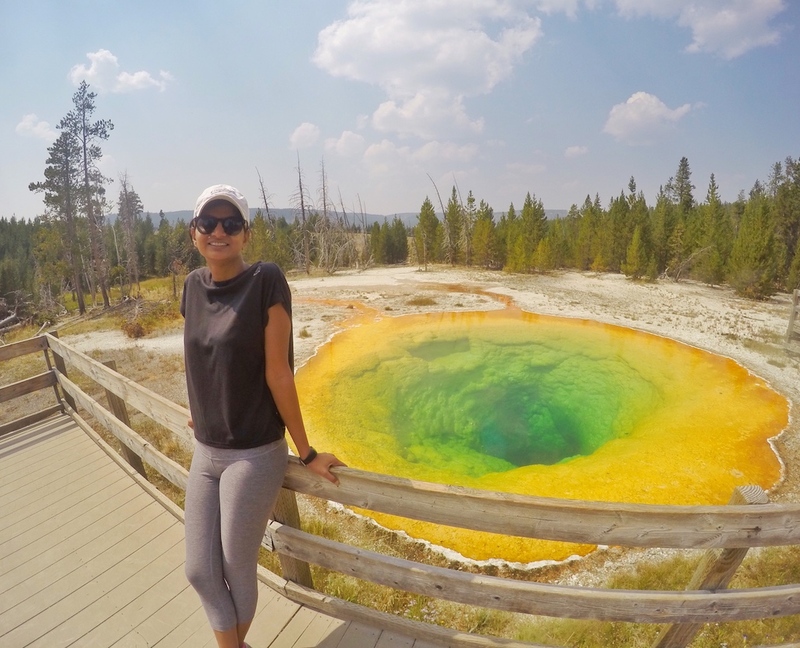 After having lunch, explore Norris Geyser Basin. This is very different in color (blueee!) than the geysers in Madison area and worth checking out if you enjoy taking pictures! At dusk, head to Hayden Valley and watch for wildlife until you have the energy for it. We saw a grizzly bear, a red fox and wolves on this day at this place, so we were beyond happy. Start the day early, and before you head down, take a quick detour to Mud Geyser, and checkout the interesting boardwalk trail. Explore Fishing Bridge and read a little history of Yellowstone around the visitor center here. If you're on the lookout, you should see plenty of birds too. Next, rent a boat and go boating on the Yellowstone Lake. We packed our food, and had our lunch in the middle of the lake with not a soul in sight. It was beautiful. Later, in the day, go on a small hike around the area. Storm Point Trail is pretty good. Apart from walking next to the lake on this trail, we also saw a family of yellow-bellied marmots sunbathing on the rocks here. Talk about enjoying the view! Start the loop drive from Colter Bay Campground and head down to Oxbow Bend, which has a beautiful view of the Mt. Moran. Drive down to Snake River Overlook, which was where Ansel Adams took his shot of the Grand Tetons. After trying to replicate his shot, move on to Teton Point Turnout for more fancy shoots. 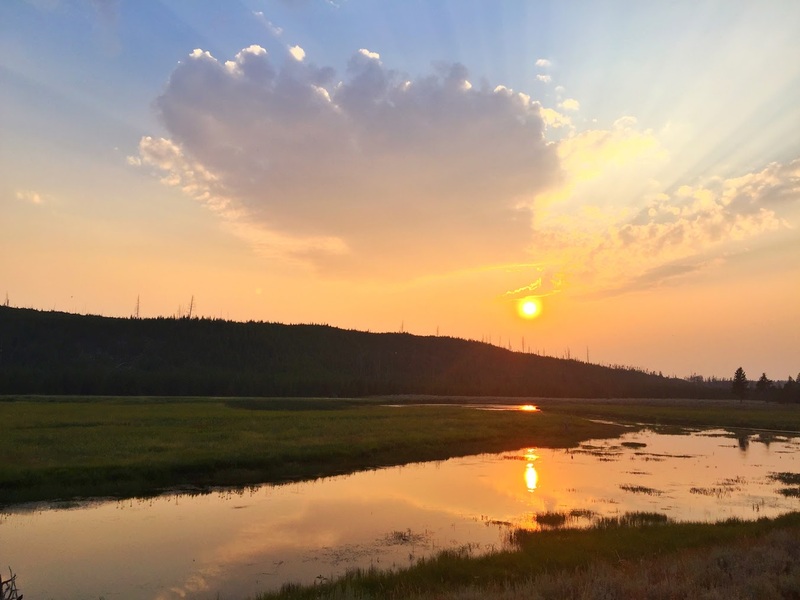 Next on the road are more viewpoints, including the Blacktail Ponds Overlook (may spot Moose because of the marshland) and Cathedral Group Turnout before you hit the stunning Jenny Lake. It's impossible to take a bad shot of the Tetons from Jenny Lake. You can explore some hikes after this. We headed back to Colter Bay and explored the Lakeshore Trail around it with some gorgeous views. Around dusk, we went back to Oxbow Bend and spotted a Moose and it's calf in the wetlands. That was how we spent our time at Yellowstone and Grand Teton. 7 days was enough to get an overview of both the national parks. We got to experience a lot of the natural beauty they offer. We saw geysers, hot springs, waterfalls, mountains, canyons and a ton of wildlife. We didn't feel rushed, but of course, we would have loved to spend more time on the hikes there. Overall, we came back satisfied, content and grateful to spend our time in raw, unfiltered nature. What do you think of the itinerary? What would you do differently?